The closing of the Hans Sumpf Company in Madera, California cuts deep into the heart of the contemporary clay world. Here was a company that during its 70-year history had perfected a much-needed product (a durable, waterproof adobe brick) and later created a unique ceramic milieu (sculptured wall surfaces in clay). In addition, the different ceramists in charge were willing to focus their expertise in an area where others feared to tread, namely the production of clay pavers and roof tiles that exactly matched their historic predecessors. From our perspective at Tile Heritage, Hans Sumpf has been an invaluable and irreplaceable resource. Hans Sumpf, the man, was born in Coalinga, California in 1914, the son of a German immigrant. He studied engineering at Stanford, and in the mid-1930s he borrowed $300 from his father and developed a formula, an asphalt emulsion, for waterproofing adobe, a traditional building material in the Southwest. He partnered with George MacFadden, an expert on adobe; they traded bricks for land—and made more bricks. A major flood inundated Fresno in 1939; in the aftermath, Hans was invited by many homeowners to make bricks in their front yards! An early job was the restoration of the Mission at San Juan Bautista. For those who drive on Highway 101, south of Gilroy, the mission’s shrine on the highway is also made with Hans Sumpf adobe. The company also supplied adobe and roofing tiles for the restoration of earthquake-ravaged Mission San Jose in Fremont. last twenty years and has served as the company’s last president. His final job has been the reproduction of floor tiles for the Biltmore Hotel in Santa Barbara. Hans Sumpf died unexpectedly in 1985. His wife, Louise, maintained control of the company until her death last year. Their children, although recognizing their father’s legacy, have no personal interest in the company. In fact, the land on which the company is situated, as well as the other land owned by the company, is worth far more than the company would ever be, many times over. This is their heritage; these are the times in which we live. Closing with a staff of six, the company ends small and yet a giant in its specialized field. We would like to extend our thanks and appreciation to all those who over the years have produced a product of such remarkable distinction. To Tom Bryan and to Bobbie Kemp Van Ee, the company’s secretary/treasurer who served as Mrs. Sumpf’s private secretary for 28 years, we offer a warm salute as only fired clay can provide. The Tile Heritage Foundation is presenting eight (8) workshops in 2006 as part of “Keeping the Craft Alive” There is a fine array of offerings at many skill levels including architectural ceramics, image transfer techniques, mosaic, raku tiles, sculptural tile making, slab-rolled ware and Talavera-style tile painting. Teachers this year include: Donna Billick, Irene de Watteville, Douglas Gray, Christine Merriman, Sheila Menzies, Sheryl Tuorila, Mark Tomlinson and Ivette Vaillard. The dates, teachers, locations and listings are now available, along with a full description of each workshop and printable registration forms. NCECA 2006 — 40th Annual Conderence will be held March 8-11 at the Oregon Convention Center in Portland, Oregon. “Explorations and Navigations: The Resonance of Place” was inspired by the explorations of Lewis and Clark, who ended their long journey near Portland over 200 years ago. The conference is expected to attract over 4000 attendees who will participate in a full array of panels and lectures dealing with varied aspects of the ceramic arts. More than 100 exhibitions have been especially mounted in galleries and museums to coincide with the event. For details visit www.nceca.net or call either Ted Vogel (503 768-7398) or Thomas Orr (503 297-5544, ext. 128). SAMA 2006, “Beneath the Surface,” will be held March 15-18 at the Chicago Holiday Inn Mart Plaza. The Society of American Mosaic Artists plans two full days of mosaic workshops, bus and walking tours to selected installations, lectures and panel presentations, various receptions and exhibitions as well as the closing night party. For details go to www.americanmosaics.org (click on Conference) or email Dawnmarie Zimmerman at operations@americanmosaics.org. See you there! Coverings will once again be held at the Orange County Convention Center in Orlando, April 4-7. This is the most comprehensive tile and stone marketplace in the Americas, and the preferred forum for hard surface education, exhibits and purchases. The exhibit floor spans over 505,000 net square feet, which puts Coverings firmly in the top 30 events in the United States in terms of exhibit space. There will be attendee representation from approximately 100 countries, attesting to Coverings’ integral role in the tile and stone marketplace. Likewise, Coverings packs the most purchasing power of any tile and stone exposition. More than 32,000 industry professionals from around the world are expected to converge in Orlando at Coverings 2006! And Tile Heritage will be there, under the Canadian, Mexican and U.S. flags, in Booth 2816. Stop by and say “hello”! Your Coverings experience, April 4-7, will be enriched by an ongoing, big-screen, presentation of architectural masterpieces from around the world. Centrally located in the main lobby of the Orange County Convention Center, the visual display of historic tile, stone and mosaic installations will capture the attention of all passers-by with its size, color and design. From the ruins of the Roman Empire to the majestic remains of medieval abbeys, from the ornate royal palaces of Portugal to the grand tiled mansions along the California coast, this exhibition, sponsored by Coverings and produced by the Tile Heritage Foundation with technical assistance from Audio Visual Innovations (AVI), will provide its viewers with a unique, dramatic experience, leaving all both inspired and entertained. Tile Festival 2006 will be held on the grounds of the Moravian Pottery and Tile Works, Doylestown, PA, on Saturday and Sunday, May 20 & 21. This annual event will include quality tile artists and makers, and dealers of historic tiles from around the country who will gather to display a large and unique selection of ceramic art tiles. Like in past years, beautiful and rare examples of handcrafted tiles will be displayed and available for sale during this event. Public support of this special occasion continues to grow each year. Last year’s event drew over 1600 visitors. Proceeds benefit the curatorial and educational programs of the Moravian Pottery and Tile Works. For further information, call Vance Koehler at (215) 345-6722 ext. 26 or email vakoehler@co.bucks.pa.us. We’ll see you there! “Tiles of the Northern Plains: Building on Tradition” will be held September 13-17, 2006 in Duluth and Minneapolis. The focus of the conference will be on the remarkable achievements of local tile makers and mosaic artists as well as the historic traditions that have nurtured this development. There will be tours, both guided and self-guided; presentations by noted tile historians; studio demonstrations and workshops where participants will get a firsthand view of all the goings on; and exhibitions, at least two planned at this time, that will feature contemporary tile work and its historic predecessors. Keep these dates free: September 13-17, 2006. The conference is being presented by the Handmade Tile Association and the Tile Heritage Foundation. We all look forward to seeing each other there! Details forthcoming. As one of the great institutions of the American theatre since 1917, the Pasadena Playhouse remains committed to the development and presentation of a culturally diverse variety of theatrical productions at the highest level of artistry. In May of 1925, a beautiful new theater, one of the first in southern California, was unveiled on South El Molino Avenue. Opening night was a magical evening, full of lights, and the scent of jasmine, celebrities, memories and, most of all, promise. Architect Elmer Grey’s jewel of a building took center stage, appropriately adorned as it was with a wall fountain designed and fabricated by Batchelder- Wilson, the enterprising tile manufacturer in nearby Lincoln Heights. As part of a recent $8.5 million renovation of the famous playhouse, the Batchelder fountain was restored to its original glory. The focal point of the piece is a 4 x 8-inch dolphin fountainhead that had been destroyed by vandals in the mid-1970s. The Tile Heritage Foundation was able to locate an illustration of the original dolphin in its archives, which was subsequently given to master ceramist Jim Sullivan at Sullivan Ceramics in Topanga, California, who produced the replica. Amy Green at Silverlake Conservation took charge of the restoration, cleaning and repairing of the fountain itself, a $16,000 project. Today, the theatre produces a year-round six-play season of 275 performances featuring over 100 artists, designers, directors and playwrights. More than 130,000 patrons visit each year, including over 12,000 subscribers who travel from 400 zip codes. Imagine all those people coming face to face with a beautifully restored Batchelder fountain! What’s a Gazetteer? Now we know! Not an especially common term in the States, a gazetteer is a dictionary or index of geographical names… so? Well, we can now safely, proudly in fact, report that the UK has been thoroughly gazetted. Lynn Pearson, a member of the tile society’s committee in England (TACS), with the assistance of numerous volunteers, has been gazetting about for the last 10 years or more recording in situ installations of tiles and architectural ceramics. The result is the recently published, soft-cover book titled Tile Gazetteer: A Guide to British Tile and Architectural Ceramics Locations. The fully packed 512 pages are startling in the sheer density of their content. Far from a mere listing, each site —and there are hundreds upon hundreds—is described in full historic detail! The body of the book is organized alphabetically by county, first in England, then in London proper by borough, and then in Isle of Man, Scotland and Wales. Within each section the geographic sites with installations are also arranged alphabetically and referenced for future research. And, most importantly, there is an index of places, another for artists, designers and manufacturers (and a biographical directory of same), plus a glossary and bibliography. This is a fully equipped guidebook for sure! The pièce de résistance is found in “Introduction: Decorative Ceramics in Architecture” where many of the leading tile scholars in England share with us their perspectives and expertise on various subjects—tidbits of wisdom from those who have dedicated their professional lives to the preservation of our favored ceramic gems. It should be mentioned also that there are two full-color sections in the book, each with superb photography, and occasional black and white pictures throughout that accompany the text. Who should own this book? Any tile enthusiast, especially those who have visited the UK or those who dream of doing so in the future! To obtain a copy, email Chris Blanchett at Buckland Books buckland.books@tiscali.co.uk. Bakers have always known about the virtues of old fashioned brick ovens. Breads baked in this time proven way have beautiful golden crust, a rich grain flavor and an earthy aroma that permeates the kitchen. 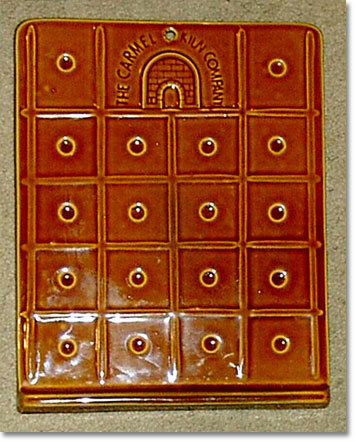 Inspired by the rewards of creating, baking and savoring brick oven breads, the Carmel Kiln Company of Carmel, California produced a unique ceramic surface, copyrighted in 1977, known as The Greatful Bread Plate to assure complete circulation of oven heat around the dough causing perfect rising and uniform baking. There is nothing like the satisfaction of baking bread from scratch using the variety of natural ingredients available today. Combine yeast, water and brown sugar. Cover and let stand in warm place. In large mixing bowl, combine 1 cup scalded milk, 1/3 cup vanilla sugar, ¾ tsp. salt, 3 well-beaten whole eggs (hold out small amount of beaten eggs for glaze), ¾ cup melted butter and frothy yeast mixture. Then, gradually add 5 cups unbleached white flour and blend in at intervals until a semi-soft dough is formed and clears sides of bowl. Knead dough on floured surface until velvety (6-8 minutes). Place in large bowl that has been lightly greased with butter. Cover bowl with damp cloth and place in warm spot to fully rise (90 to 120 minutes). Knead dough about one minute, then roll out into sausage shaped tube. Divide into 20 balls about 2” in diameter with about ¾ of the dough. With the remaining ¼ divide into balls about ¾” in diameter. Spread cornmeal onto Greatful Bread Plate and put in cold oven. Set oven at 350 degrees with empty Greatful Bread Plate in it. While oven is preheating, use sharp knife to make cross-like incision on top of each large ball. Paint large ball with the egg glaze. Insert small ball on top and glaze entire brioche. Let them rise to about twice their size before baking. Place brioche on Greatful Bread Plate to bake. Bake only 10 or 12 brioche at a time allowing enough room for expansion, For a crustier brioche, after 10 minutes of baking, spray water from a plant sprayer (or something similar) toward top of oven. The brioche should appear thoroughly baked after 20 minutes or so. Remove from the oven, place on a rack to cool, enjoy! THF invites you to share illustrative pictures and favorite recipes for clay, glaze, tile making or kitchen treats with other readers. Click here to view past E-Newses!